Red is February’s color. Heart-shaped boxes of chocolates. Red hearts on the Valentine cards we share with lovers and friends. 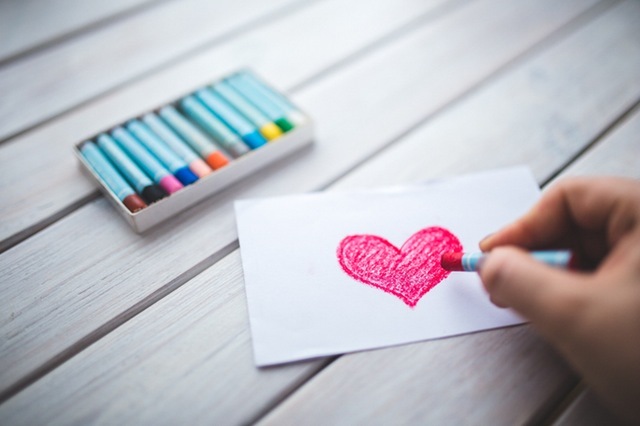 Red hearts imprinted on a vast array of merchandise in hopes that it will inspire a purchase for a loved one. Red is the color of love. The color of love, is also the color of sacrifice, and this month we celebrate two men who guided us through the only wars that drenched American soil with the blood of sacrifice. February 12 is the birthday of Abraham Lincoln who not only freed the slaves, but was the tourniquet that held our bleeding country together through the Civil War. February 22 is the birthday of our first president, George Washington, the general who led the untrained, ill-equipped rebel colonists to victory against the colossal British Empire in the equally bloody Revolutionary War—an astounding David vs Goliath victory. Blood, war, and death are repulsively gory. But those wars and that blood established and preserved our glorious land of freedom. Red is the color of blood. The color of sacrifice. My novel, Balaam’s Curse, is set in an alien world. An ancient culture nearly impossible for the modern mind to comprehend. In that strange Old Testament world, worship consisted of slitting the throats of sheep, goats, and cattle in sacrificial rituals; spattering or dabbing the blood on various tabernacle furnishings; sometimes burning the entire carcass, sometimes eating part of the roasted flesh. And we cringe. It doesn’t feel like worship to us. We, who spare no effort to save the whales or rescue kittens and puppies, are so repulsed by the blood and gore of Old Testament animal sacrifices that we cannot wrap our minds around why God would command people to do such a thing. Are we more sensitive than God? Surely not. Jesus made it clear that God knows every sparrow that falls. Pain and death on our planet touch the heart of God. So why would he require the death of animals? All that spattering of blood ? All those mind-boggling rules and regulations for sacrifices found in Leviticus were given along with detailed instructions for building the stunningly beautiful tabernacle, a palace where God could live in the heart of the camp of Israel. The sacrifices were never to be offered anywhere but at the great bronze altar located at the entrance to the tabernacle courtyard (and later on the replacement altar at the temple in Jerusalem). As the bloody rituals were carried out day after day, year after year, the people began to make the connection between love and sacrifice. God loved them. He wanted to dwell with them. But he was holy; they were faulty. The sacrifices provided a way for them to approach his magnificent presence. There was no way they could have fathomed the sacrifice of Christ that was coming, but the rule book told them, “I’m giving you these regulations so you won’t die.” The book of Leviticus includes one graphic story of Aaron’s two eldest sons approaching God with “strange fire.” Flames from the divine presence instantly incinerated them. Not because he punished them in anger for breaking a rule, but because they tried to approach the holiness of God in their own way. He had given them a shield of protection in the form of procedures and rules, but they deliberately chose to ignore it. After that I suspect many Israelites watched the flames consuming the carcass of the daily burnt offerings thinking, “That should have been me.” And they were glad for the substitute. Through the sacrificial dramas enacted at the sanctuary, the new nation of Israel began to understand that red was the color of sacrifice and the color of love. As they followed God’s very specific rules of engagement, they experienced the awe of life in his holy presence. Those sacrifices didn’t undo the damage caused by their sin, but God had provided a way for them to be restored to fellowship with him. Who wouldn’t worship a God like that? 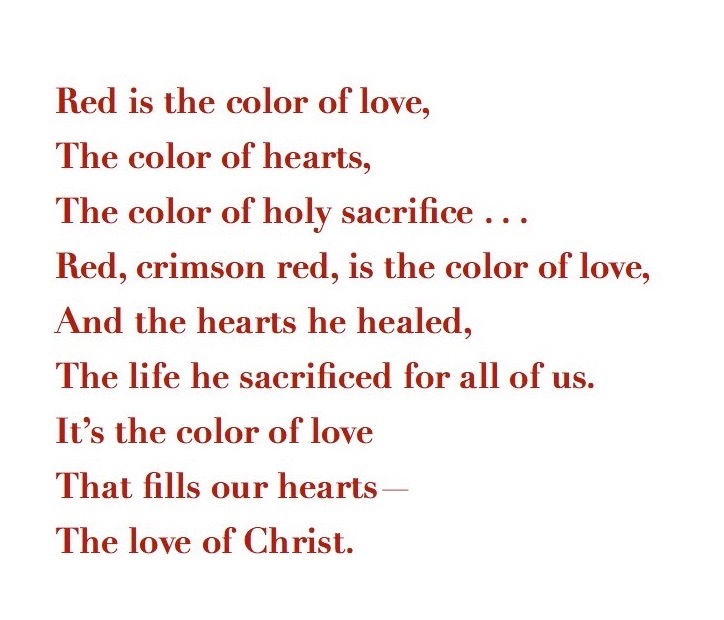 Red was the color of blood, the color of God’s love. The ultimate demonstration of the destructive nature of sin and the extent of God’s love would come centuries later at the cross. Until then “Apparently nothing short of this kind of disturbingly graphic procedure could adequately impress on ancient people the eternal death-and life consequences of sin and of salvation through a single sacrificial transaction that had not yet occurred.” (Roy Gane, The NIV Application Commentary, Leviticus, p. 24) The ancient Israelites were learning a shadowy version of Romans 6:23: “For sin pays its wage—death; but God’s free gift is eternal life in union with Christ Jesus our Lord.” (Good News Translation). February is a month for remembering the connections brought together in the color red. 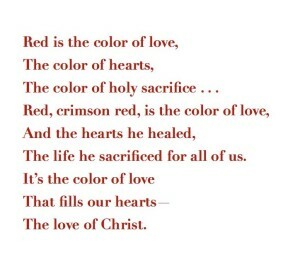 Red is the color of love, the color of hearts, the color of holy sacrifice.